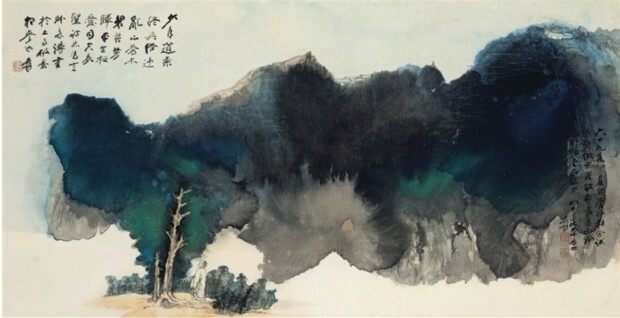 Image Caption: “Scholar beneath mighty tree,” painted by Zhang Daqian, who is among the most popular and highest-selling artists in the world. It is hard to believe that just thirty years ago, it was illegal to sell art in Mainland China. Now, China has become the world’s biggest art and auction market. With more than 400 auction houses spread across the country and billions of dollars in revenue at stake, China is experiencing a huge growth in its creative and cultural economy. The highest echelons of Chinese business and political circles see art collection as a worthwhile investment option. Chinese masters including Zhang Daqian and Wu Guanzhong are featured amongst the highest-selling artists in the world. Beneath the stretched canvas of the booming art market, however, lies a dark structural frame of fraud and corruption, acknowledged by Chinese stakeholders and the international community alike. Indeed, art has become a preferred tool for corrupt behaviors amongst business people and public servants in the Middle Kingdom. With this context in mind, the bibliography below presents ten sources with which the issue of Chinese art corruption can best be examined–its manifestations, its stakeholders, and its impacts on the global art economy. These articles, podcasts, and books add separate puzzle pieces to one cohesive and nuanced narrative regarding the challenges facing China’s art market. These sources include a news release from China’s Central Commission for Discipline reprimanding corrupt behaviors in the art sector, a book on the economics of globalized art, a research-driven paper detailing the effects of bribery on Chinese art prices, and three annual reports released by strategic and management consultancies regarding the art market, among others. From these important sources, one may identify a few important trends and patterns that are worthy of note. Above all, it is crucial to note the dubious nature of the Chinese art market as it exists right now. There are extremely sticky norms, including a robust gift/graft economy, that facilitate corrupt transactions and the smooth embezzlement of ill-gotten gains, even with a national awareness of the dangers and immorality of bribery, money laundering, et cetera. There is therefore a concerted effort from the top-down to clean up a variety of sectors, and a bottom-up understanding that corrupt transactions must be carried out more subtly. The trend identified here is important to understand—art corruption, especially bribery using works of art, has become a relatively risk-free and untraceable way of conducting corrupt affairs under the radar, especially when compared to other channels of stocks and real estate. 4) Economic concerns and capitalist leanings have transformed art from a cultural entity to just any other commodity. Art has been tokenized and simplified to be merely a disposable resource like any other. John Zarobell’s Art and the Global Economy provides an overview on the globalizing dimensions of the art market, and China’s involvement in international art events. Antony Ou’s article, “The Chinese Art of Elegant Bribery,” goes in depth about the ways in which elegant bribery is carried out in fraudulent manners, adding to a national discourse exposing the unethical officials who think they are going the “elegant” route. Louisa Lim’s NPR piece supplements our discussion by focusing the spotlight on the intermediaries in the process—the dealers, the auction houses, the appraisers who must play along in order for art corruption to thrive. Abigail Esman then focuses on the state/auction house relationship, and adds commentary to the important dimension of state intervention in the art market. Wang Qishan’s news report is a fascinating primary source that reveals several other ways in which public officials engage with corruption through art. This piece also impacts the bibliography because it contains a governmental rebuke of art corruption, and a promise of future punishment. The Art Media Agency article provides insight into Chinese art money laundering, which adds a transnational dimension to the crime. The Barboza et al. exposé on The New York Times is one of the most cited articles about Chinese art forgery and authentication, providing valuable discourse on China’s unique culture valuing copying as technical skill. Jia Guo’s statistics-loaded economics paper details the ways in which elegant bribery hikes up prices of artwork. The bibliography rounds out the issue of price manipulation by examining the causal factors that lead to China’s unrealistically booming creative economy. There are also two sources which are annual art market reports, one by The European Fine Art Foundation (TEFAF) and the other by Deloitte. Through a detailed examination of both regional and global art market trends, both reports perfectly pinpoint China’s economic zeitgeist. Both offer predictions of reform efforts, global art market instability, and threats to the system. A pattern worth noting is that of elegant bribery, or yahuiin Mandarin, as described in Barboza et al.’s New York Times article. Elegant bribes involve the briber gifting someone a worthless piece of art, asking that person to put the object up at an auction, then purchasing the worthless piece as if it were worth millions. Money changes hands in this questionable but seemingly legitimate manner, moving parallel to other transactions flowing through the already-established gift/graft economy. The pattern of elegant bribery is not surprising. In fact, bribery through artwork and artefacts can be traced back throughout China’s ancient dynasties. Ever since the Ming dynasty (1368–1644), elegant bribery has been an uncontrollable dilemma for the ruling emperor. The Ming emperor had to confiscate over 6000 items of priceless calligraphy and paintings from a general, who identified these pieces as bribes from his subordinates. It can be argued that elegant bribery appeals to a large population of Chinese business people. With an authoritarian government, it is always better to act without a paper trail, especially when dealings concern ill-gotten gains. Bribing people with cash more often than not leaves a dangerous paper trail, with which the government can ascertain the exact amount of money transacted and the parties involved. Now, with Xi Jinping’s anti-corruption campaign in full swing and many victims crushed by the regime, it is more important than ever to obfuscate records of corrupt activity. It is indeed hard to argue that the auctioning of a calligraphy piece, a work of art, or even a simple scroll was a million-dollar bribe. Indeed, the sources in the bibliography also reveal that corruption, and bribery specifically, is an art form in itself. One who hopes to engage with bribery through art sales must adopt certain techniques and strategies, identified by the openEconomy piece. In order to be successful in elegant bribery, there are broad brushstrokes with which one can understand the art pieces at stake. There are nuances in the workings of auction houses that must be taken into context. There is a need to factor in the “shadings and highlights” of China’s gift economy and business culture. Corruption is often seen as heavy-handed, but there is nothing clumsy about elegant bribery. The subtlety and opacity brought about by roundabout, behind-closed-doors negotiations emphasizes the “classiness” of art corruption. Another pattern identified through these sources is the misleading nature of payments and money collection. Accurate record-keeping and accounting are paramount in most art dealings. Art industries have the obligation to carefully and meticulously report sales and transaction details. Furthermore, the global art market needs accurate accounting information to best estimate the value of the market. In China, as the sources above reveal, nonpayment on auctioned art items is extraordinarily common, but the record books continue to reflect sales as if they were followed through. Auctions in China often deal with nonpayment issues in careless ways, with 41 percent of Chinese auction pieces remaining unpaid, according to a 2016 report commissioned by Art Basel and UBS. Evidence and analysis of these “sunk cost” transactions show through all ten sources, appearing again and again to remind readers of the inaccuracy of the art market monetary valuation. It is already exceedingly difficult to evaluate how much the global art market is worth, a problem that is exacerbated by the untruthful manner in which Chinese auction houses operate. There are strong ties between the authoritarian government and a variety of art hubs, including auction houses, galleries, and private art collections. Now, with the Chinese debt bubble looming over the country leaders’ heads, and with the downturn in art sales since 2011, the trend shows that relationships between private actors and the state have soured slightly. The government has the ability to infiltrate the workings of these art hubs, as they have done in the past. Beijing actually forced the shutting down of an art gallery due to allegations of forgery. In some ways, government intervention in the supposedly-free art market has helped crack down on corrupt behaviors and the detection of forgeries and fakes. On the other hand, the state’s motives are generally more complex, and their actions have severely affected the operations of auction houses and the pricing of artwork in China. The overly-involved and all-powerful regime has actually shown patterns of effective anti-corruption reform in the past, and has notably thrown in jail some of the biggest names in the Chinese art world. Cultural trends are also important to examine, especially since China may look to a clean art market as the backbone of soft power diplomacy in the future. The question that demands introspection links the relationship between the commodification of art and the cultural implications of artistic production. Currently, it does seem like Chinese buyers view art as merely an investment in a capitalist economy to accrue value. As a result of this cultural pattern, it becomes easier to predict exactly the outcomes of each auction, with the same experts providing similar advice regarding best practices and most valuable pieces to obtain. The Chinese demand for luxury items, including famous art, has truly transformed the role of art in society. In China, artwork is the perfect asset, and there are barely any concerns regarding art’s role in corrupt actions since it is a regular source of income just like any other. While the world sees exorbitant growth and fantastic art investment opportunities, readers of the following bibliography will understand that the Chinese art market has built its reputation off of forgeries, bribes, artificial pricing, and unstable transactions. With a volatile regime in power, especially one that has a history of cracking down on corrupt behavior, it is crucial to acknowledge the fraudulent nature of the Chinese art market and enact actionable policies to normalize ethical dealings in the creative economy. Zarobell, John. Art and the Global Economy. University of California Press, 2017. Deloitte Luxembourg & ArtTactic. Art and Finance Report 2017, 5thEdition. Deloitte and ArtTactic, 2017. https://www2.deloitte.com/content/dam/Deloitte/at/Documents/finance/art-and-finance-report-2017.pdf. Guo, Jia. What Drives the Chinese Art Market? The Case of Elegant Bribery. Columbia Business School, 2011. https://www8.gsb.columbia.edu/sites/chazen/files/Jia_Guo_Chinese%20Art%20Market.pdf. McAndrew, Clare. The European Fine Art Foundation Art Market Report 2016. The European Fine Art Foundation, 2016. Pownall, Rachel A. J. The European Fine Art Foundation Art Market Report 2017. The European Fine Art Foundation, 2017. Barboza, D., Bowley., G., Cox, A. “A Culture of Bidding: Forging an Art Market in China.” The New York Times, 2013. http://www.nytimes.com/projects/2013/china-art-fraud/index.html. Ou, Antony. “The Chinese Art of Elegant Bribery.” openDemocracy, 2011.https://www.opendemocracy.net/openeconomy/antony-ou/chinese-art-of-elegant-bribery. 7) Lim, Louisa. “In China’s Red-Hot Art Market, Fraud Abounds.” National Public Radio, 2011. https://www.npr.org/2011/10/10/141125011/in-chinas-red-hot-art-market-fraud-abounds. “Dirty Money in the Asian Art Market.” Art Media Agency,2014. https://www.artkhade.com/en/article/2/0/583/dirty-money-in-the-asian-art-market. Wang, Shaowei. “Chinese Communist Party’s Central Commission for Discipline Inspection Fifth Meeting Report.” Central Commission for Discipline Inspection, 2015. Esman, Abigail R. “China’s $13 Billion Art Fraud – And What It Means For You.” Forbes, 2012. https://www.forbes.com/sites/abigailesman/2012/08/13/chinas-13-billion-art-fraud-and-what-it-means-for-you/. ← The Significance of the ICC Case of Cote d’Ivoire’s Former Leader Isn’t His Acquittal. It’s His Arrest.